Cons - Limited utility, latency, connectivity issues with AAC (on Galaxy Note 9), SBC has some distortion, wireless charging has compatibility issues. NOTE: This is the Bluetooth 4.2 version. 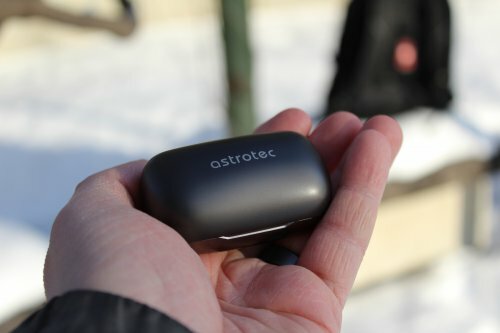 Towards the end of February 2019 Astrotec has announced a 5.0 version but it was not yet available where I purchased this. This is the second TWS earbud that I have used, after the Jabra Elite 65t. I found the Jabras to be great for utility, but their sound quality had a number of issues such as distortion and hissing on the left earbud. They use a rather generic TWS housing that is comfortable and isolates well. 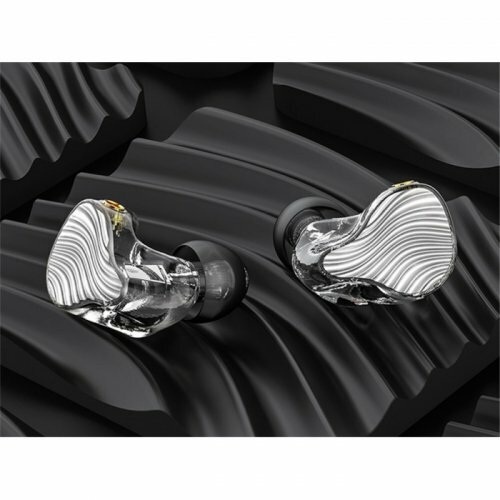 It looks great but isn't quite as creative as what Astrotec has done with their other IEMs. The shiny plastic coating around the charging case and the housings scuffs off within a rather short amount of time. After a few weeks of use, I noticed the right bud has a tendency to creak at the button, but this doesn't happen when I'm wearing them. The only major downside is it can be difficult distinguishing the left and right buds if you habitually put them on quickly. The S60 comes in a durable charging case with a metal cap. The connector is USB type C, which I think more TWS earbuds should be using. It also supports Qi Wireless charging at 5W. 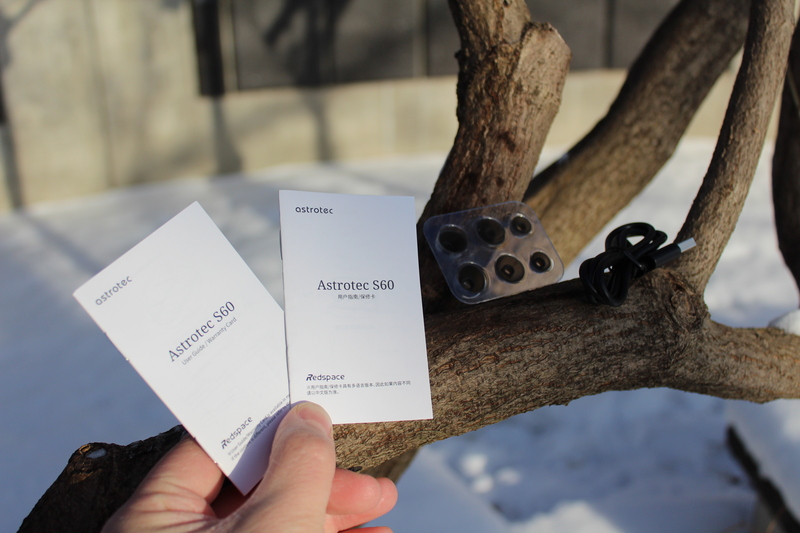 Unfortunately, compatibility is quite limited, as Astrotec recommends you to use 5W chargers. It works fine with a 10W wireless power bank, but for some other 10W charging pads I get a charging error. I also suspect the metal cap might trigger foreign object detection. Charging speed either way is reasonable (~1.5 hours to fully charge from approximately 25%) but I wish it supported fast charging. J5Create JUPW1101 Wireless Charging Pad (10W) - Fails to charge if plugged in to QC 2.0 or 3.0 charger. Fully functional when plugged into PC's USB 3.1 port. Mycell MY-PC-035 Wireless Power Bank (10W) - Charges fine. At this price point, TWS earbuds tend to be not as usable as pricier counterparts. Controls are limited to play/pause, next/previous tracks. I would have liked to see volume control (added to the Bluetooth 5.0 version) and ambient sound mode. These have Knowles balanced armature drivers and have a rather warm and bassy sound. Highs are a tad rolled off while mids have reasonable clarity. Soundstage and detail retrieval are decent but the bass is quite powerful for a BA driver. Using SBC, the sound signature is largely retained, but the sound is more prone to distortion, particularly in the left driver. Both AAC and SBC exhibit some degree of hiss and clicking EMI on the left bud, albeit less severe than the Jabra 65t. On the Galaxy Note 9, the volume output is rather low, unless you go into Bluetooth settings and turn "Media Volume Sync" on and off. This greatly increases the volume and still sounds great for AAC, but SBC becomes more badly distorted at the higher volumes. On my ASUS Zenbook 15, it clips but still sounds decent at higher volumes than the Note 9.
vs. Jabra Elite 65t - The Jabras are a brighter-sounding IEM and prone to sealing issues for my ears. Although I find the bass decent most of the time, they have a tendency to sound rolled off during transit. SBC connection is very reliable. Unless I am in a busy area and transiting, I do not get any cutouts. Unfortunately the same can't be said about AAC. I've only tried it with the Galaxy Note 9, but it has a tendency to skip or cut out after about 6 minutes of music listening, especially if you are multitasking with your phone. It is very difficult for me to say if this is simply due to my phone or if other Android phones will have this issue. I've cleared my Bluetooth cache which seems to improve the time before cut-out, but it still happens at some point. It is definitely not a defective unit as I was able to try another pair at the store with my phone that also exhibited the same cutout. I briefly tried it with the seller's iPhone to which I noticed no connectivity issues using AAC. Regardless what codec you use there is also considerable latency. 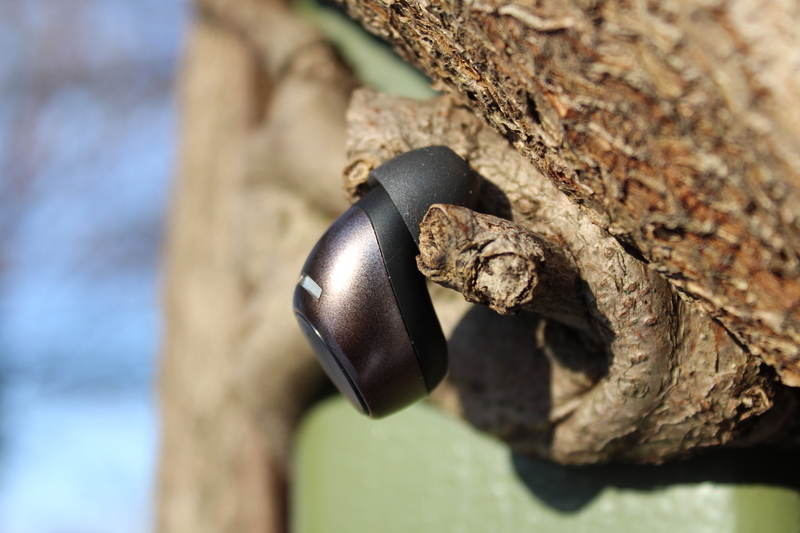 This is to be expected with TWS buds, but it is noticeably more than the Jabra Elite 65t. The S60 has such high potential for its price point, but falls short in its utility and connectivity issues, especially on Android. Perhaps the Bluetooth 5.0 version is more reliable. Today we're checking out the S60 from Astrotec, their newest entry into the fully wireless market. 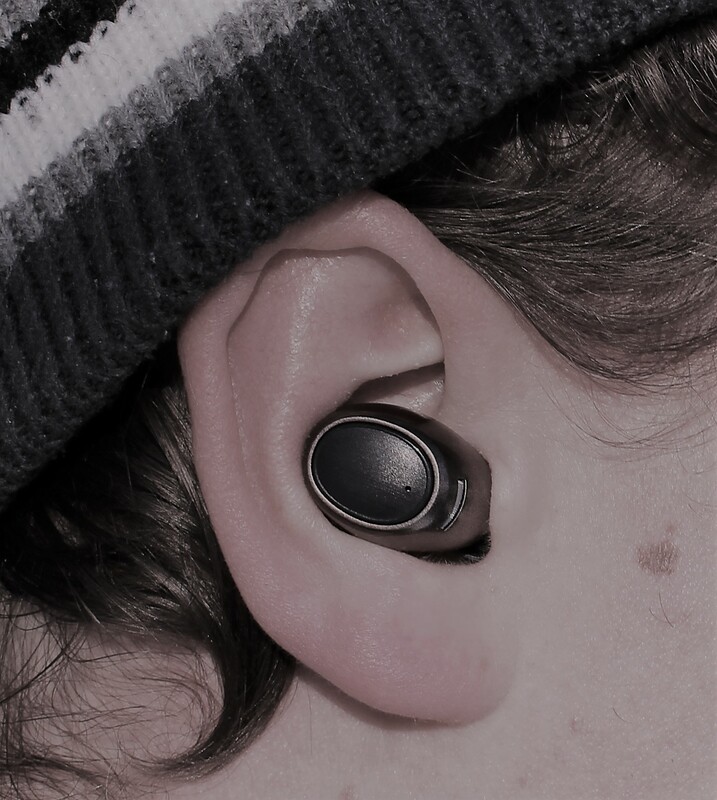 With the improvements in Bluetooth tech over the years, truly wireless earphones have become more than a viable alternative to traditional wired earphones and those Bluetooth models that connect the earpieces via a cable or module of some sort. Going fully wireless usually leads to some trade offs, as should be expected, such as lowered battery life or additional bulk in order to contain all the needed electronics and batteries. 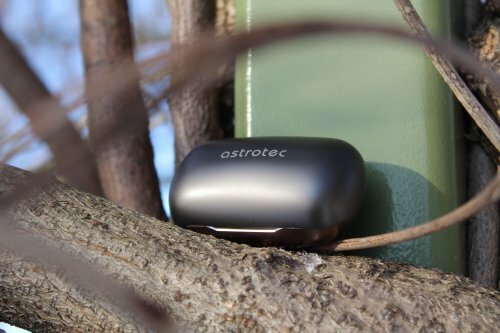 I've spent a ton of time with the S60 since it arrived in early December and despite the limitations of fully wireless, can say that I am very pleased with what Astrotec managed to pull off. Instead of going the usual route of a single dynamic, Astrotec employed Knowles' smallest RAF series full-range balanced armature. I suspect it is the vented 32873-000 model given the S60's bass performance. 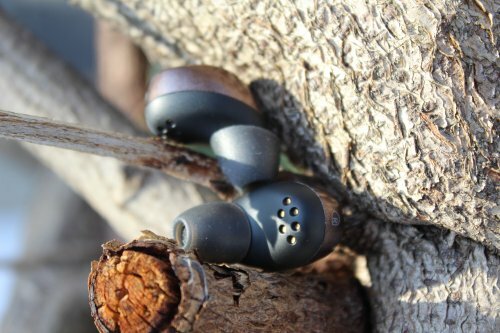 Using such a compact driver allowed them to create the smallest and least intrusive fully wireless earphone I have used to date, one that still remains competitive in other aspects. Let's take a closer look at this earphone. I listen primarily to various EDM sub-genres (liquid drum and bass, breakbeat, drumstep, etc. ), hip hop, and classic rock. In 2018 I learned that I no longer have a preferred signature and can understand and appreciate vastly different earphones. 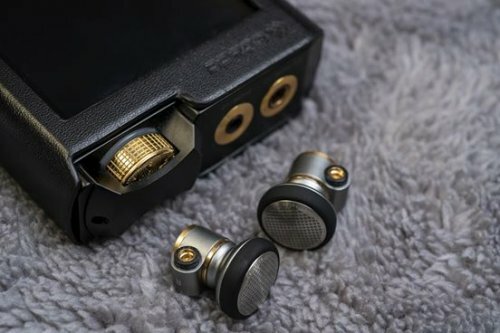 The HiFiMAN RE800, Brainwavz B400, and Massdrop x MeeAudio Planamic are examples of earphones with wildly varied signatures that are enjoyable for different reasons. I generally listen at very low volumes, so keep this in mind when perusing my thoughts on how an earphone sounds. Overall a nice unboxing experience with a pretty sparse accessory kit. The included tips are of excellent quality but the lack of variety in size and style might hurt the S60. Lucky for me, the pre-installed tips worked perfectly. I did try some alternatives, like the custom Spintfits that were provided with the NuForce BeFREE8, but they all seemed to muffle the sound. The S60's ear pieces are entirely composed of plastic. The outer half of the shell is colored to match the charge case with a large, finely meshed vent for the microphone, while the inner half is matte black with a soft texture and six copper pads, two of which are used for charging. The faceplate is one large multifunction button that depresses with a satisfying 'click', and with a pinhole opening for the LED indicator. The plastics seem chosen for lightness and as such do not feel particularly dense, yet they do not feel fragile either. I've dropped them a couple times resulting in nothing more than a small scuff on the left ear piece. Fit and finish is quite good overall with each component part fitting together nice and snug, including the nozzle mesh which is neatly applied. 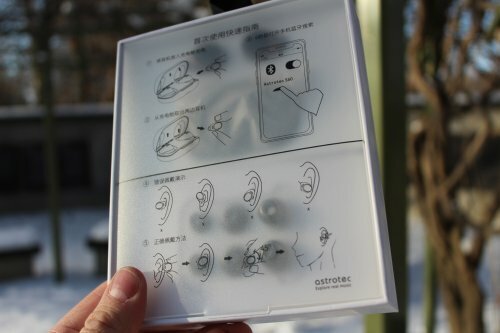 Of course, this would be necessary in order to achieve the IPX5 water resistance rating the S60 has been given. This level of protection should mean the S60 is well protected from sweat, rain, and other things that would splash liquid on the device. The charge case is made from a mixture of metal and plastic. It is quite compact, easily fitting in the palm of your hand. I found it fit perfectly in the tiny change pocket in my jeans. The lid, printed with the Astrotec logo, is all-metal and gives the case a quality feel as well as some heft. This also means the hinge is metal too and plenty durable. The base of the charge case is plastic and looks to use a thicker version of the material found on the colored portion of the earpieces. At first I found it somewhat odd that they chose to make the lid metal. Opening it up all the way causes the case to fall over due to the weight discrepancy, but it makes sense when you realize the case can be recharged wirelessly. Wireless charging doesn't work through metal. The interior is lined with plastic inserts shaped to the ear pieces. Another nice touch is that the interior is magnetic, so you only have to drop the ear pieces in and they snap into place, exactly where they need to be to start charging. There is a USB Type-C port on the back should you not have a wireless charge pad handy, though I suspect people will have these pads commonly lying around in the coming years. More and more products are supporting this method of charging, and major phone manufacturers like Xiaomi are starting to include them with their products. 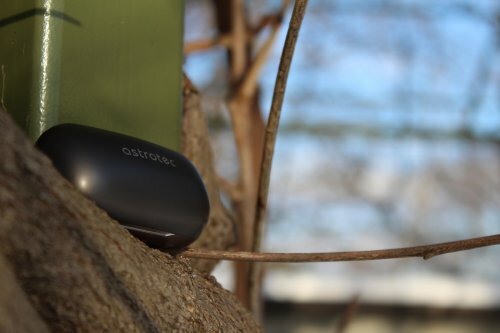 Including both wireless charging and USB-C is an intelligent bit of 'future-proofing' on behalf of Astrotec. Nice! 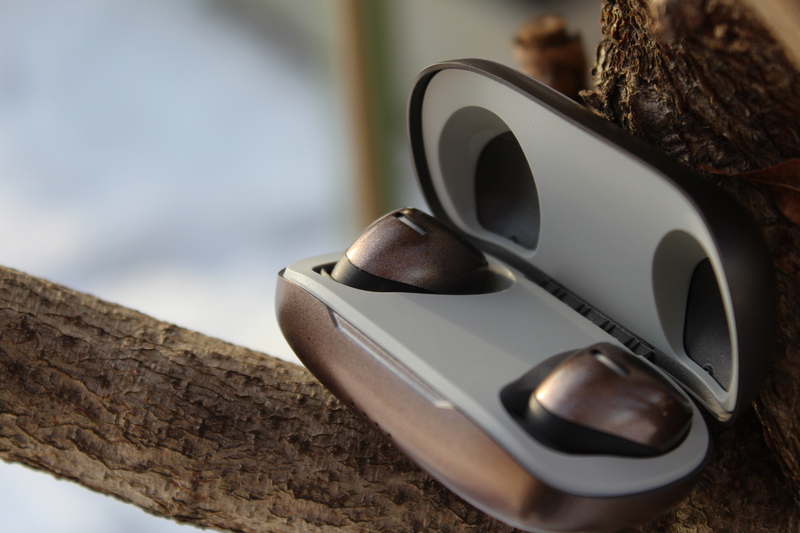 Considering they're filled with electronics, the S60's ear pieces are impressively compact. 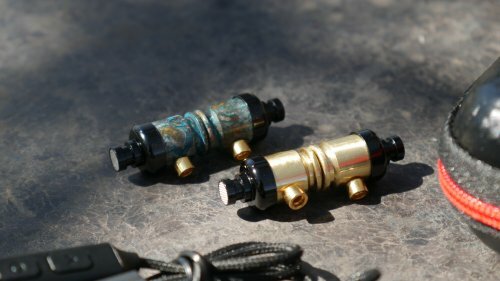 Pitting them up against a few fairly popular iems, they are slightly larger than the TinAudio T2 and nearly the same size as the BGVP DMG. 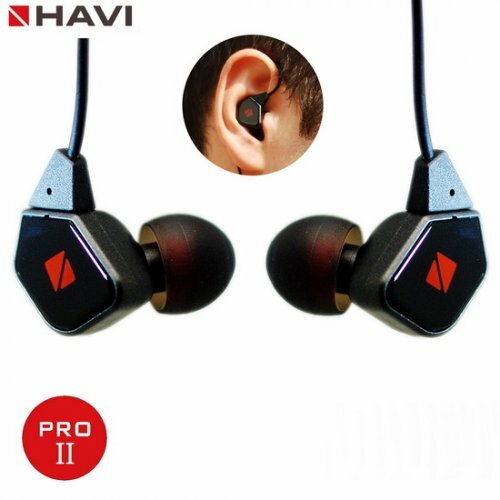 Ergonomically it is very similar to the HiFiMAN RE2000, but much lighter and with all the edges rounded off. 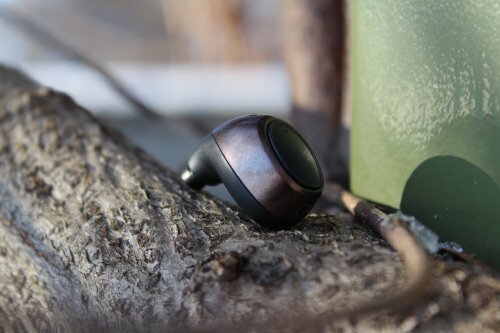 As a result of this very familiar shape and traditional ergonomics, the S60 feels like every other earphone, avoiding annoyances like ear hooks and weird custom tips that other fully wireless earphones have to employ to keep them stable and secure. This also means the S60 is very comfortable and has an extremely low profile, so they are quite versatile. I have no issues using them while lying in bed, out in windy weather, or wearing them under a toque (Canadian winter hat). When it comes to passive noise isolation the S60 does a good job. There is ample ventilation sure, but the use of armatures instead of dynamic drivers and a form fitting design does a good job of blocking exterior noise. I can easily listen to the S60 at fairly low volumes in noisy areas like the local coffee shop, and when walking around the city. They won't be replacing something with active noise cancellation, but they're certainly above average when compared to similar products. For the purposes of testing, a few different devices were enlisted for pairing with the S60; LG G6, LG G5, Asus FX53V laptop, F.Audio S1, Shanling M0, and Shanling M1. Taking the left ear piece S60 out of the charge case automatically has it searching for a source device. Left is the primary, right is the secondary. They automatically locate and connect with each other when out of the case. 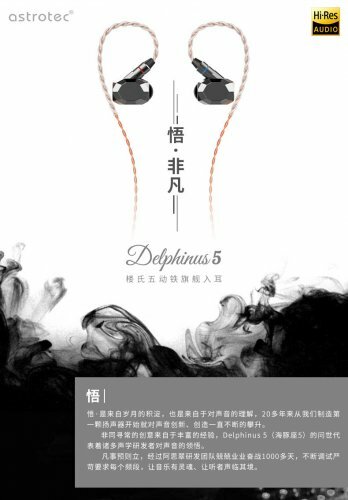 The S60 was quickly recognized and paired reliably with everything except the Shanling devices which it absolutely refused to interact with. They would register the S60 existed, but would always fail to pair. I wasn't able to find a way around this. With those devices that did work with the S60, namely anything not made by Shanling, the connection quality was for the most part strong and stable. In a few instances on the initial connection it would rapidly drop then reconnect a few times, then eventually stabilize. I've experienced this with other fully wireless iems with similar specs so while not ideal, this isn't something out of the ordinary, nor anywhere near frequent enough to be considered a problem. Range is just fine. I'm able to set my source in a central location and listen pretty much anywhere in my apartment. But, as is often the case numerous obstacles or covering the source or earphones with your hand will cause the connection to stutter and eventually drop. Thankfully I didn't run into issues like having to place the source in a certain pocket or location to maintain a stable connection like I have with older fully wireless earphones like the Syllable D900S. Overall I find the connection quality to be quite stable and reliable, with only occasional hiccups that do little to mar the experience. The S60 is rated for around 3 hours of listening time, with an additional claimed 9 hours possible thanks to the charge case. For me at the low volumes I listen at, 3 hours of use was easily achieved and exceeded in most cases. The S60 does not have any on-board volume controls and instead relies on the source device. Out of 15 possible volume levels with my LG G6 ThinQ, I listened to the S60 between 3 and 5 most of the time, often at level 1 if listening before bed. Higher volumes are going to drop that time so I suspect most are going to hover around or just under that 3 hour mark. Note that when the S60 starts to run low, for the final 5 minutes of remaining life you will hear a low battery warning letting you know it is time to juice up. Supported Android phones, like my LG G6, will also display a battery life indicator at the top of the screen. Handy quality of life features in my opinion. While 3 hours might not sound like much, I'm pleased it's as good as it is considering how compact these ear pieces are. There is only so much room for all the electronics, battery, and drivers. Charging the ear pieces is quick too at only an hour making the achievable play time more comfortable. Since I've been using the S60 as my daily secondary earphones when out and about, I just toss them back in the charge case when not in use and rarely run out of battery life. After a couple days when the case needs a re-fill, that's a quick top up during work or while I'm sleeping. The S60 won't be amazing for marathon listening sessions, but they're clearly not intended for that anyway. Treble is rolled off with some emphasis in the lower treble regions. This gives them solid detail and clarity with a decent bit of air between notes. The resulting sound isn't particularly sharp or sparkly and has the benefit of being reasonably detailed but still quite easy on the ears. The Crystal Method's “Grace feat. LeAnn Rimes” and it's usually painful and shrill effects are actually quite bearable through the S60. That right there is worth applause. The midrange is fairly thick and free of sibilance, as evidenced running through my gamut of Aesop Rock tracks, such as “Blood Sandwich” which is particularly unforgiving of earphones that tend to exacerbate such unwanted qualities. Female vocals are well represented too with a smooth, intimate feel to them. Sarah Barthel is certainly seductive and inviting throughout Big Grams'”Run For Your Life”, and in “Fall In Love” of Phantogram fame. Timbre is realistic and natural making King Crimson's live rendition of “Night Watch” an engaging experience. The S60's low end rolls of early as experienced with Kavinski's “Solli” and as such doesn't provide a ton of sub-bass. Otherwise, it hangs with the most single armatures I've heard and is among the more bass rich of the bunch. Mid- and upper-bass is tight and punchy without any bleed into the mids. It is quick and snappy with strong separation making for a positive showing with EDM. I'd have a hard time believing anyone who said these were light on bass. It is one of the more prominent aspects of the S60's signature and why I suspect they are using the vented version of Knowles' 32873-000 full-range driver. The S60's sound stage is fairly average leaning towards the provision of an intimate experience. As a result they start to suffer from congestion when a track gets particularly busy, such as the closing minutes of King Crimson's “Starless And Bible Black”. They do a better job with more simple, modern pop tracks like K/DA's “Popstars” which plays to the S60's fairly average technical ability. Still not bad for a fully wireless product, but I was hoping for slightly better performance here given they're the only earphone of this style I've tried using single armatures. I have a feeling the lack of advanced codec support is hurting the S60 here and that with LDAC or at the very least, aptX, they'd be a bit more impressive. Overall I find the S60 a really enjoyable listen. The mildly bass leaning signature with smooth, rolled off treble and prominent mids makes for a good experience when using them outside in the real world. The amount of bass on offer isn't drowned out by the noise around you, vocals remain true and clear, and the mellow treble allows you to raise the volume if needed without becoming shrill or overbearing. The slightly congested sound stage and average clarity may not make for the greatest of critical listening sessions, sure, but that's clearly not what these are for anyway. Nuforce Optoma BeFREE8 (149.00 USD): The BeFREE8 has a more v-shaped signature than the S60 with it's single micro-dynamic offering up better end to end extension. It's bass is deeper, hits harder though with less control, and is more textured. It's mid-range is a bit thinner and less prominent but with more air between notes. Treble is more prominent with more upper emphasis giving the BeFREE8 additional sparkle. Some might find this tiring, others might find it more engaging. Either way, I think it suits the v-shaped sound much the same way the S60's rolled off upper end suits it's particular tune. The BeFREE8 has a larger and more spacious sound stage with more accurate imaging. Overall I do think the BeFREE8 is the slightly better sounding earphone, though I can definitely see many finding the S60's more relaxed presentation preferable. In terms of the rest of the product, they trade blows quite well. First up, the BeFREE8 has better battery life at 16 hours total (4 plus an extra 12 from the charge case) versus the S60's 12 (3 plus an extra 9 from the charge case). I find this difference perfectly acceptable given the BeFREE8's earpieces are larger and less ergonomic. The charge case is almost twice the size of what Astrotec created and is all plastic with no support for wireless charging. I'm happy to give up 4 hours of use in exchange for size, durability, and convenience, especially when I never felt the S60's battery life lacking at all. Connection quality to the source device is pretty equally reliable between the two. Despite the BeFREE8 using some pretty unique tech to connect the ear pieces to each other (NMFI), the S60 certainly wasn't shamed and was more resistant to forced disconnects (i.e. deliberately blocking the connection). NMFI is great when the ear pieces are being used properly and disconnects are very rare, but as soon as you take them out of line of each other the secondary ear piece will disconnect. I've found in the year I've been using them, it has led to the primary ear piece always running low on battery first. This doesn't seem to be a problem with the S60. 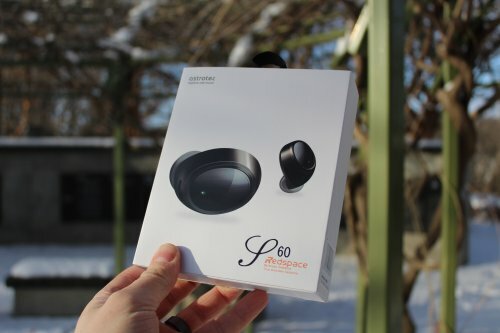 Despite the huge discrepancy in price, I enjoyed my time with the S60 more than I have with the BeFREE8, an earphone I am very familiar with by this point. You are giving up some sound quality and a fair bit of overall battery life with the S60, but you gain improved comfort, better build quality, and a slightly more reliable wireless connection. While I haven't been able to take advantage of it yet, I do consider the ability to wirelessly charge the case and USB Type-C big pluses since those are becoming more common place features and are completely absent in the pricier BeFREE8. I've tried quite a number of wireless products over the years with only a handful making a strong case for ditching traditional cabled products. First there was the ADVANCED Model 3, then the plussound Exo-BT cable, then the NuForce BeFREE8 followed most recently by the Radsone Earstudio ES100. The Astrotec S60 can be added to that exclusive list as an outstanding every day carry. The earpieces themselves are tiny and fit like any other earphone. 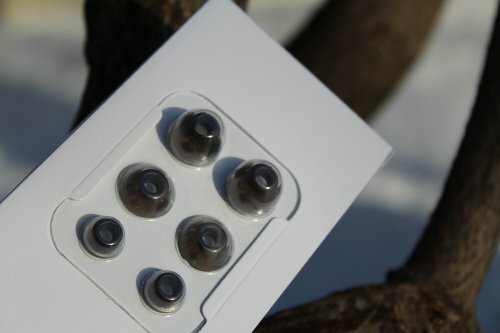 The charge case is compact and durable, not much larger than two Blistex lip balm tubes, and as such easily fits into pretty much any pocket. Carrying it around isn't an inconvenience. I would love for there to be greater support for higher quality codecs, but Astrotec did a good job selecting a driver that work work well within these limitations and tuned it appropriately. If you're in the market for a fully wireless earphone and do not mind a more relaxed presentation, I'd definitely keep the S60 on your short list. These sound great but on my Galaxy Note 9 they stutter after around 5 minutes of use with AAC.